There are a few of us over at the G35driver forum that have had trouble locating the Reverse trigger wire near the front of the car to tap into and connect with our aftermarket headunits to enable reverse camera use. A couple guides have told us to look for a Purple(coupe) or Orange(sedan) wire down in the drivers's side kickpanel, but the wire simply doesn't exist for us, and I think what we all have in common is that we're driving manual transmission(except one guy who drives an '06 AT), while the guides shown were written by AT drivers I assume. I see where it talks about a Purple wire(which again, IS MISSING for me) on the left diagram but I'm not sure I want to touch anything from the right diagram or the diagram on page 140. I'm about to give up the search and just get a really long wire that connects from the headunit to the trunk at the reverse light (where my camera's power wire is already connected). Last edited by Rawrster; 12-23-2015 at 02:30 AM. Short of using a multimeter to test each wire for a reverse signal, it may be easier to use a long wire to the trunk. Let us know what you end up doing. hello. do we have any updates on this or did you just ran a wire all the way to the back? 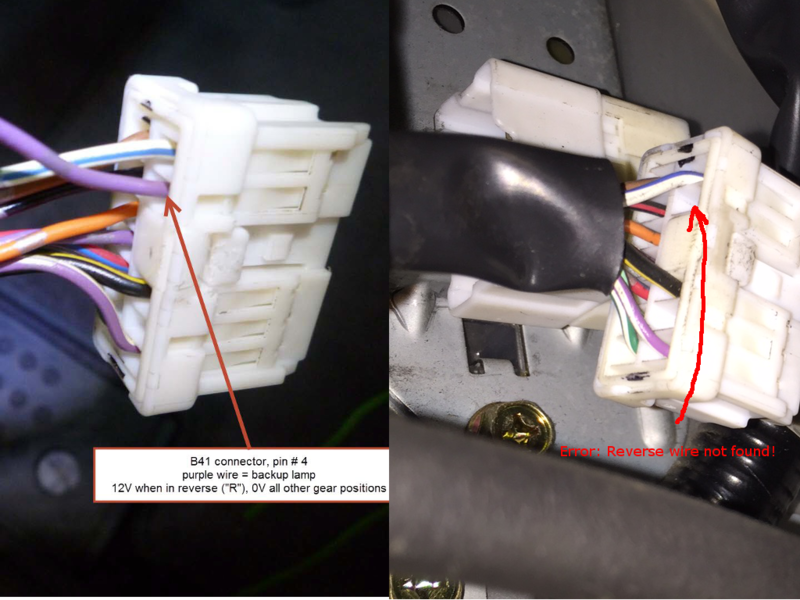 my 04 coupe doesn't have any wire connected to B41 port 4, like what the pictures and manual are saying. and i couldn't find any info about this anywhere else either. please let us know. thank you!